Following the apparent success of elrow Presents Rowshow 'Sambodromo Do Brasil' in Birmingham, London and Leeds, the Spanish party reveal a new theme for upcoming shows at In:Motion Bristol on Saturday 5 December and Studio 338 London on Saturday 12 December. 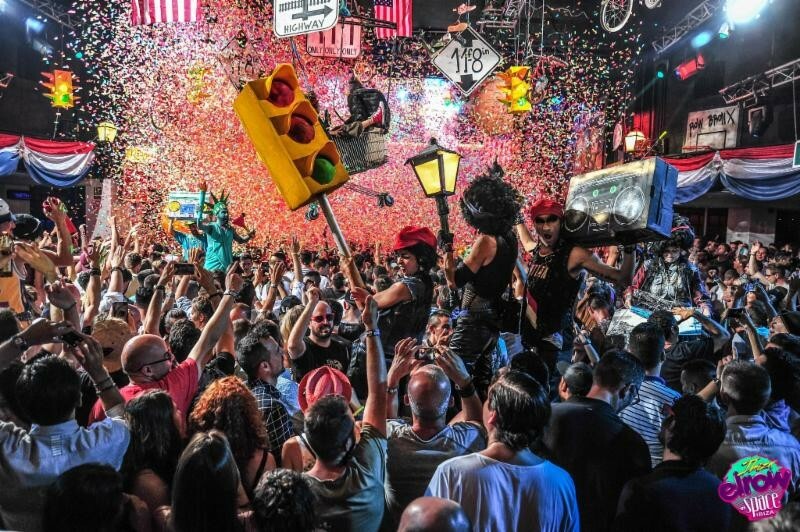 elrow Presents Rowshow 'el Bronx' will be a kaleidoscopic celebration of US culture. The immersive clubbing experience will recreate the hustle and bustle of downtown New York, adding their own flair with an inventory of confetti cannons, mountains of inflatables, troops of performers, dancers and stilt-walkers. The after-movie from elrow Presents Rowshow 'Sambodromo Do Brasil' at Studio 338 on 5 September has just been released, capturing the vibrance, energy and fun of elrow events. Brainchild of the Arnau family, elrow is the newest project from a dynasty of Spanish promoters, who have forged a legacy over three generations that counts Monegros Desert Festival and Florida 135 amongst their accolades. Their UK forage sees them teaming up with Jo Vidler of Secret Productions and Bristol Motion.